Reading this, one could ponder the definition of a “Catholic minister” in this sense. Every sacrament has ministers who perform them. But who are these ministers? It turns out they vary depending on the sacrament. Today we will begin to look at this, as well as other issues in a sacramental refresher: a who, what, when, where, and how of sacraments. This article focuses on the sacraments of initiation. In future posts, we will address the rest of the sacraments. What Does a Sacrament Require? First of all, a sacrament needs a minister who intends to confect the sacrament. Intention is important. Sacraments are not “magic spells” where words and objects have power, but moments in which God grants the privilege of allowing us to be part of his plan to deliver grace. So if someone, for example, were to sleepwalk while pouring water on someone and saying the formula for baptism, it would not be valid. Aside from that, the minimum that is needed are referred to as “form” and “matter.” These would be the “how” and “what”. Form is what is said and done and matter is whatever is required to be present. Not everything that normally occurs in a sacrament is required. For example, some very important parts of the baptism rites whose symbolism is important to what is going on (the candle, or the white gown) do not constitute sacramental matter because it is possible to have a baptism without them. spoken while water is poured on the recipient (Code of Canon Law, Canon 849). Traditionally, the water is poured three times on the head, or the person is immersed three times, but this is not required. The rest of the ritual: the vows rejecting Satan, the presence of a godparent, the aforementioned gown and candle are important, but not necessary. For a baptism to be valid, all that is needed is to have the words above spoken, and the water to be poured on someone. Please note, this form must be followed strictly for the baptism to be considered valid by the Church. As an example, if someone baptizes “in the name of Jesus,” or even speaks of the persons of the Trinity, but does not use their individual titles (“Father, Son, and Holy Spirit,”) this would not be considered valid. “The ordinary ministers of Baptism are the bishop and priest and, in the Latin Church, also the deacon” (Catechism of the Catholic Church 1256). However, ANYONE can baptize validly. This leads to several additional factors. For example, when many Protestants choose to come into full communion with the Catholic Church, there is often no need to baptize them again. If their previous denomination baptizes with the same formula that Catholics do, the Church considers this a valid baptism. A tangential note here regarding the “when” of baptism: once. It need not, and in fact cannot, be received more than one time. Further, it is preferred, but not required, that baptisms occur on Sunday, or at the Easter Vigil (Canon 856). Also, the person baptizing need not be Catholic, or even a baptized Christian themselves. As long as they intend to do what the Church believes to be true when they are pouring the water and saying the formula (there’s the required intent), the sacrament is considered valid. Normally, baptisms done by a lay person would only be done in cases of emergency. If there was no grave need to wait for a priest, this would be illicit, but still valid. For this reason, DON’T just go around giving out baptisms like they are party favors. Why? Well, for one thing, the Church names the ordained as normal ministers for a reason. This way they know what is done, and that the formula is followed correctly. If I start going around baptizing folks just for kicks and giggles, I’m obviously not taking it seriously, I may not follow the form correctly, and one could argue that I don’t have the proper intent, thus invalidating it. Baptism is not just a symbol. Baptism is truly making a change in the person. As the minister, one has a responsibility to make sure that the person they are baptizing (or their parents, if it is an infant or child) desires this. Another practical reason is that the Church requires a record of the baptism to be kept. 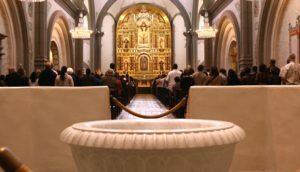 In cases where a baptism takes place outside of the Church, the person who administers the sacrament, if they are not the pastor of the local parish, is responsible for informing the pastor of the parish where the baptism took place—the date and details—so the parish has a record (Canon 878). This touches on another aspect of baptism: the “where.” It is expected that baptisms take place in a church unless it is necessary for the baptism to take place elsewhere. Again, this way the record is kept safe as it stays where it was. One more thing should be considered regarding the ability of anyone to baptize validly. I am aware of cases in which parents baptized gravely sick children or infants who would not survive until a baptism at a church could be scheduled. What a beautiful gift this is (both the gift from the parent to the child, and the gift of the Church to the parent, in allowing this)! Situations like this are why the Church allows anyone to baptize in cases of grave necessity. I also have heard anecdotal evidence of people baptizing their healthy child, even though they were going to schedule a baptism. Please refrain from this. As was mentioned above, there is a way baptism should be handled, and unless it is truly a grave necessity, we should let the ordained minister handle this. If, however, you are aware that an infant (or adult for that matter) was validly baptized prior to a scheduled ceremony, please let the priest or deacon know. They can continue the ceremony but in place of the actual pouring of water and baptism, they can administer a “conditional baptism,” that is, a baptism that will confer all the graces of the sacrament if the original one was not done validly. “the reception of the sacrament of Confirmation is necessary for the completion of baptismal grace” (CCC 1285). This is why in the Eastern Catholic Churches, confirmation is given immediately after baptism. As for the “who” of this sacrament, this is the bishop. While Eastern Catholic Churches usually confirm right after baptism, and thus the priest is directly administering, the bishop is still the original minister in these cases because only a patriarch or bishop may consecrate the oil that the priest uses when confirming. In the Latin church, the ordinary minister of the sacrament is a bishop, but in some cases due to unavailability of the bishop or other grave reasons, a priest may confirm, again using oil consecrated by the bishop (CCC 1312-1313). “Be sealed with the Gift of the Holy Spirit” (CCC 1300). Regarding the location of confirmation, it is desirable that confirmation take place in a church, during a Mass, but this is not required (Canon 881). When is confirmation celebrated? There is some variety here. As was mentioned above, Eastern Rite Catholics celebrate it immediately after baptism; Latin Church tradition waits until the confirmand has reached the age of discretion (CCC 1307). Baptism and confirmation initiate the individual into Christianity, but the Eucharist completes this initiation, connecting the individual with the rest of the Church at the wedding feast of the Lamb. I don’t think this or any blog post is enough to discuss the theology involved in this “most august sacrament” (Canon 897), but to maintain continuity with the rest of this post, this section will stick to the who, what, how, etc. In other words, if a priest saying the Eucharistic Prayer stumbles over the pronunciation of “Chrysogonus,” or is traveling and accidentally says the name of the bishop where he was yesterday, this does not invalidate the Eucharist. But when consecrating the bread and wine, the words above must be said in their entirety. As I wrote above, in addition to form and matter, the intent of the minister matters as well. Only the bread and wine that the priest intends to confect becomes the Body and Blood of Jesus (so you can’t sneak some extra bread into Mass and walk away with it as the Eucharist). Traditionally, this is why the priest often places the chalice and ciborium on a small white cloth called a corporal, so there is no doubt as to what bread and what wine he intends to consecrate. Which brings us to the “who” of the Eucharist. There are several ways to answer this. Firstly, in order to consecrate the Eucharist, this is a simple answer: only someone ordained as a priest can do so. One way the Eucharist is different from the other sacraments though, is the fact that the minister who confects the sacrament is not necessarily the minister who administers the sacrament. Often he is, but due to the practicalities of the number of people at a Mass, sometimes there are other ministers. The ordinary minister of the Eucharist is a bishop, a priest, or a deacon (Canon 910). The same canon does go on to describe extraordinary ministers as well: instituted acolytes or lay faithful who can also assist in the distribution of communion. When and where are pretty simple: at Mass. In fact, it is unacceptable for a priest to attempt consecration outside of holy Mass (Canon 927, which also—fun fact—states it is unacceptable to only consecrate one species and not the other). Mass obviously normally takes place in a church but this is not required. Hopefully this has been an informative post. In the future I hope to go over other sacraments and what is required too. If you have any questions or suggestions for other topics you’d like to learn more about, please leave them in the comments below. Photo by Prayitno on Flickr.